Edit cluster details such as the configuration profile associated with a cluster and run an installation or configuration job to update a cluster. Note: Upgrade jobs are only applicable at the datacenter or node levels. Tip: Learn more about authentication schemes behaviors and limitations in LCM. 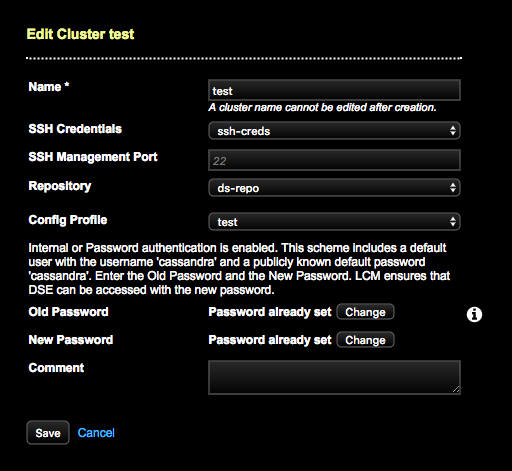 Select the cluster to edit in the Clusters pane and choose Edit from the Clusters pane menu. The Edit Cluster dialog displays. If the cluster name has an alias, the Display Name appears as a read-only field above the Cluster Name. To edit or remove the alias, see Changing the display name of a cluster. If the cluster does not currently have a configuration profile selected, an inline instruction prompts you to select one so that LCM can determine the authentication protocol and prompt for credentials upfront if necessary. Note: If authentication is not enabled within the selected configuration profile, there are no prompts for credentials. See authentication schemes supported in LCM for more details. 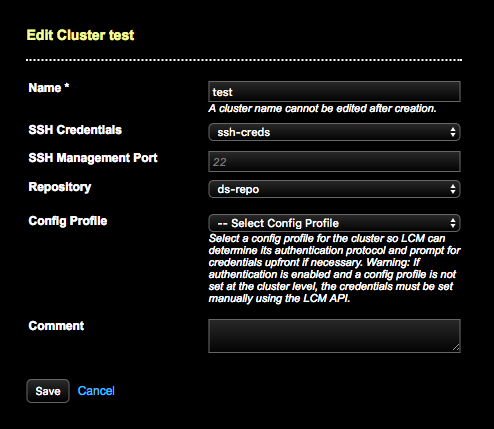 Make any changes, such as selecting a new Config Profile to associate with the cluster. If prompted, enter the appropriate credentials for internal authentication. Enter the Old Password, New Password, and Confirm Password for the cassandra user if internal authentication is enabled as the default scheme (default). Tip: When editing a cluster that has authentication enabled in its configuration profile, the changed password fields are shown as already set. Click Change to change the password for the cassandra user again. If a password has already been set but needs to be changed, click Change for the Old and New Passwords. Enter the old password and new passwords to update them. Click the remove stored password link to explicitly remove stored credentials. After clicking Save, the credential is queued for removal. The LCM API no longer returns old-password: true. The LCM API does not return stored passwords for obvious security reasons. Retaining or removing the stored password is at the discretion of your organization. Depending on the edit, run an install or configure job at the cluster level.